A new roundabout was created at the junction of two rural roads in Clackmannanshire, Scotland’s smallest county. The centrepiece is unusual. 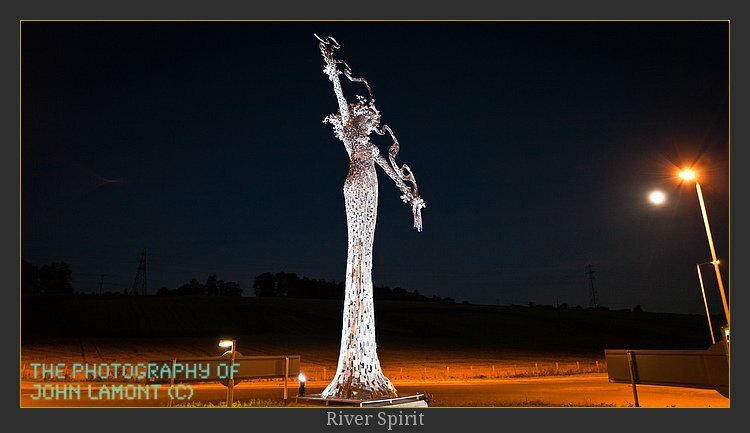 A stunning bright creative metal latticework in the form of a lady holding a metal squiggle which is called River Spirit. When erected, it was unclear who the Artist was as there are no markings or nameplates. What did the squiggle mean? I contacted its creator who told me it is a map of the meandering River Forth formed by metal rods. So this Lady facing North holding (the river) Forth. 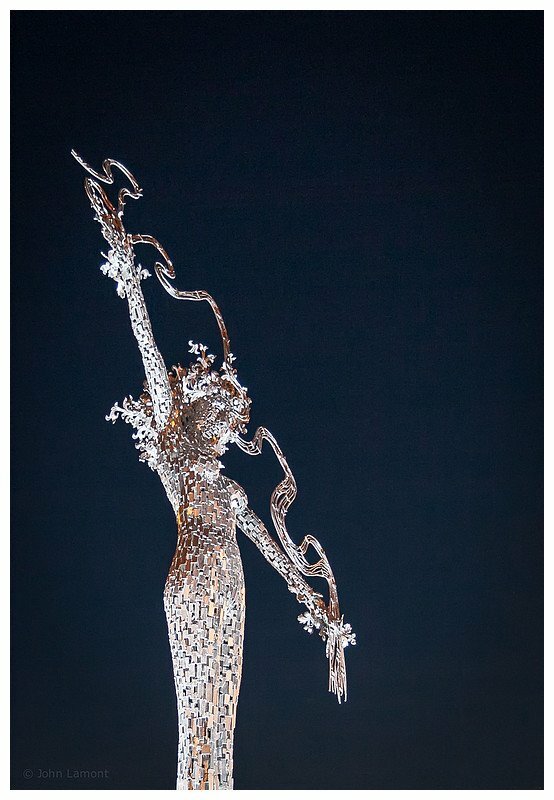 The figurative Artist is a Glaswegian called Andy Scott. 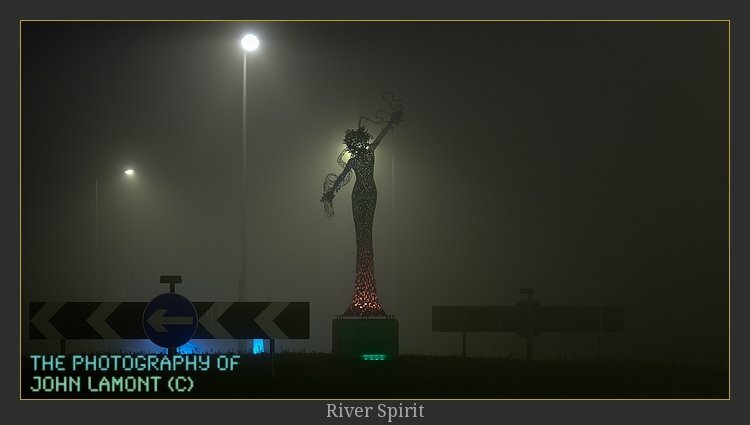 Consequently Andy Scott sculptures are very popular on Clackmannanshire roundabouts. Andy describes the piece as “a combination of practicalities and aesthetic” citing that its placement required the sculpture be tall for sight-lines and prominence. He continued “I wanted to relate to landscape, environment…idea of being classical ‘terminus’ sculpture from formal gardens etc. half column, half figure” Andy added that there is a ‘partner’ piece being installed at Muirside roundabout at the end of January. This male form will also face North (to the Ochils) and be in a more dramatic pose. “He relates to earth and sky, she to earth and water”. The typical counter argument to these public structures is that the money is better spent on more ‘worthy’ items like school books or more Nurses etc. There is never enough money for those things and there never will be. If I can draw a parallel with personal and public spending priorities. Within homes, some decide to buy large plasma televisions even though the old device still functions (and uses less energy). Or choose to buy a new sofa suite before the old one becomes un-useable. Or paint their walls to ‘freshen’ things up. Most do this instead of paying off the Mortgage or hiring tutors to extend their Children’s education. Sure its complex, but part of the reasoning is that most people understand how important it is to live in pleasant places. So lets extend this sense of living in a good environment to the outdoors and our public spaces. I think we can have a higher bar for our environment than litter-free. While photographing this new art installation I observed reactions, almost every driver looks at her as they drive around and some smile. Therefore public art improves public spaces. Andy – job done ! UPDATE NOVEMBER 2016: Tidy-up of language. UPDATE FEBRUARY 2018: Tidy language, Repair links and add Google map.